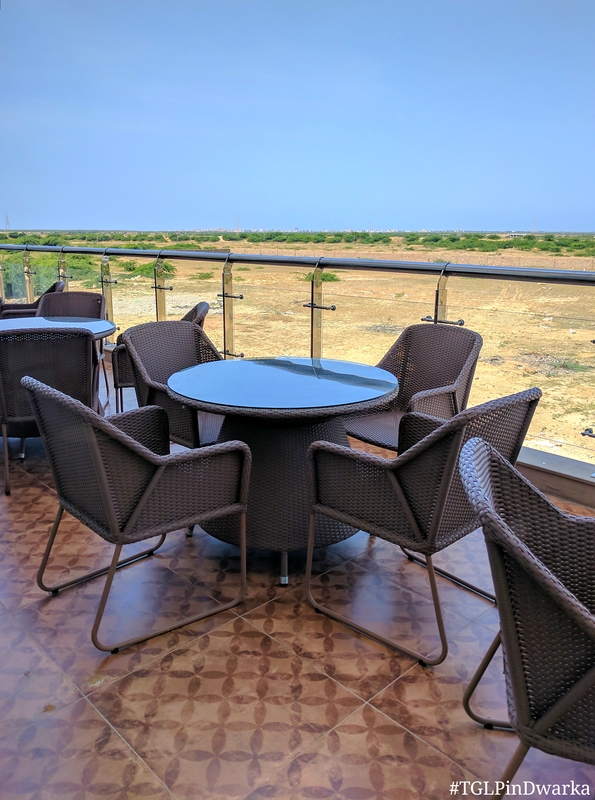 Dwarka – A place I didn’t exactly have on my travel/pilgrimage list, but ended up visiting and experiencing it at it’s finest when “the calling” came. One of the significant Dham among all 4 dham (chaar dham = 4 holy places), it became Lord Krishna’s adopted home after he left Mathura and since become a pilgrimage site for His devotees. So when I decided to make this pious place my home for 2 days, it was with the very best the little town has to offer. 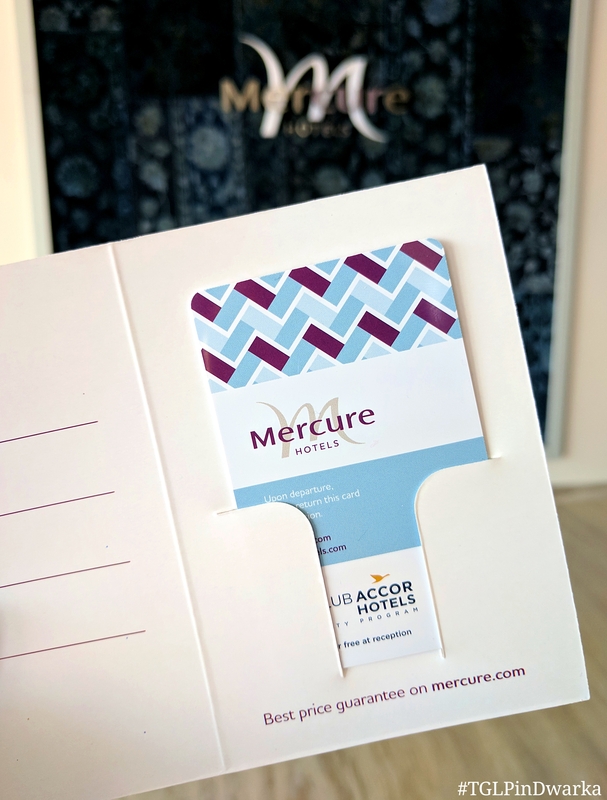 The newly opened Mercure Hotel is the first international hotel group in this holy land and it stands out – literally and otherwise. 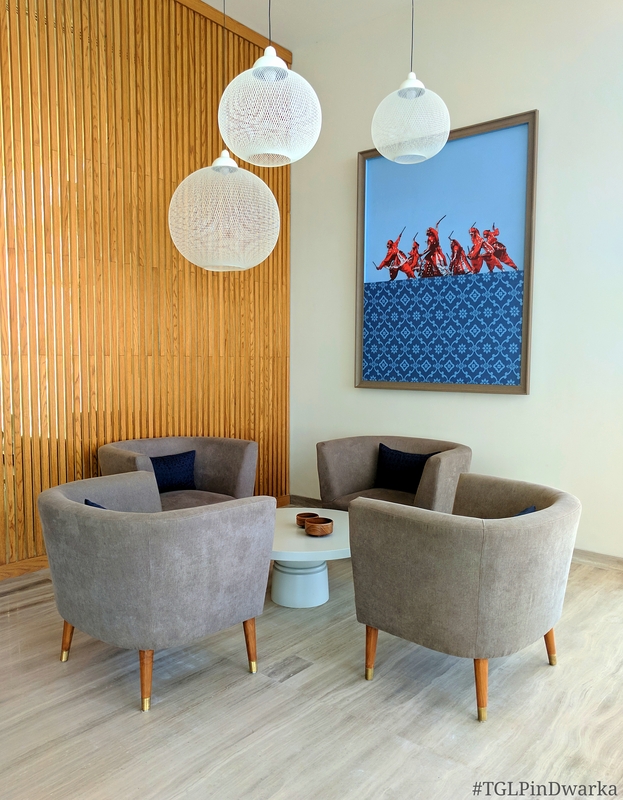 Located almost in the middle of nowhere (the openness of the space was a refreshing change for the Mumbaikar in me), it is at a convenient distance of about 10 minutes from the main Dwarkadhish Temple. 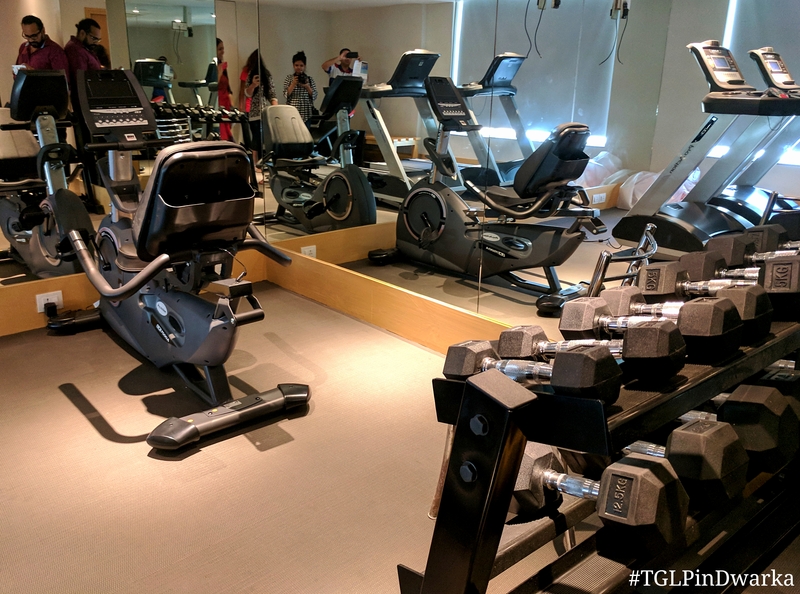 It stands tall with 5 floors, houses 99 comfortable, minimalistic rooms, 1 suite on the top most floor, a pure vegetarian all day dining restaurant called ‘Maakhan’, a compact but well equipped gymnasium (for all those workout enthusiasts!) and a conference/banquet space that can hold about 40-50 people which can be used for various events and purposes. 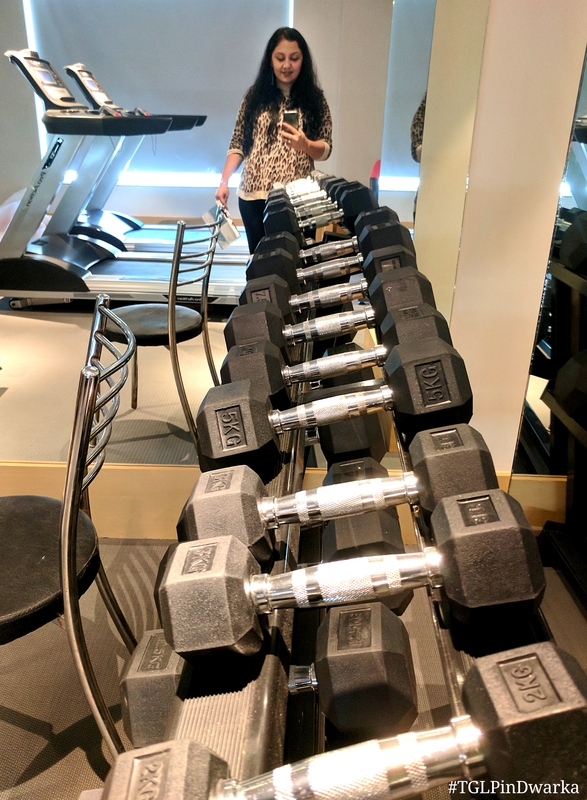 So let’s talk about the room first since that’s usually my most favourite and important part of any hotel experience. 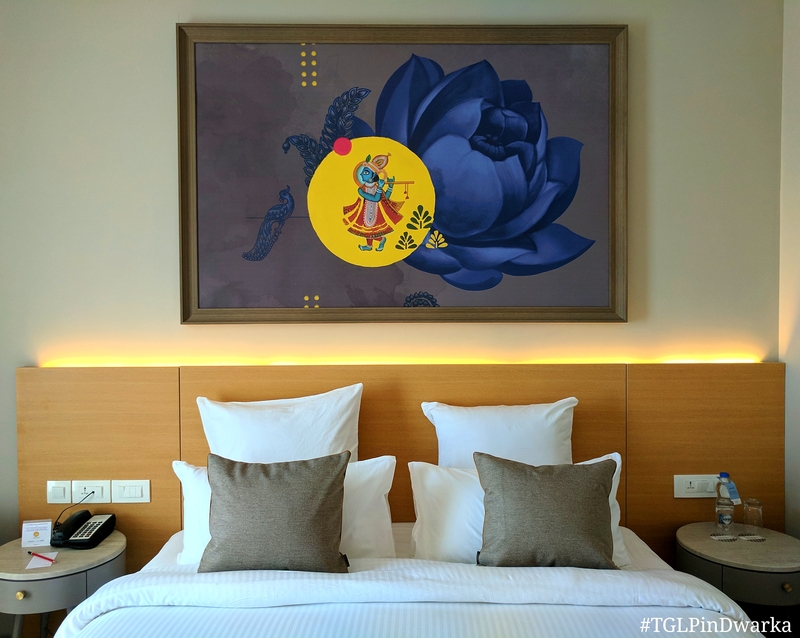 Every room possesses the same layout… including the stunning painting of Lord Krishna that I instantly fell in love with. It adds that much needed character to all the rooms, at the same time it exudes a sense of calm without being overly religious. I say this because this is a pilgrimage site and the expectations may differ. PS. The elephant painting by the study is equally beautiful. The bed, as expected, is comfortable and so are the other seating options within the room. 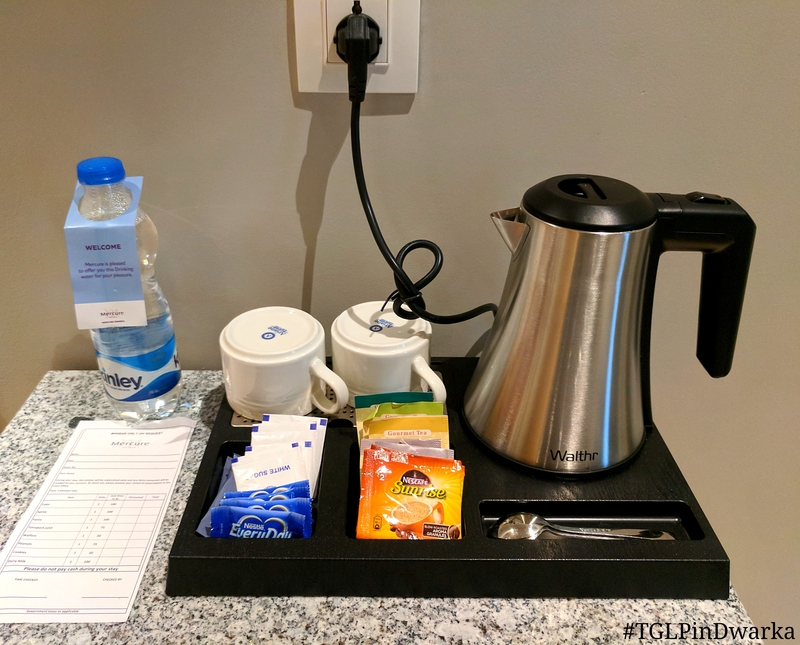 They also have a kettle and in-room tea/coffee/milk powder sachets just in case you feel like sipping on something while you relax and enjoy your stay. 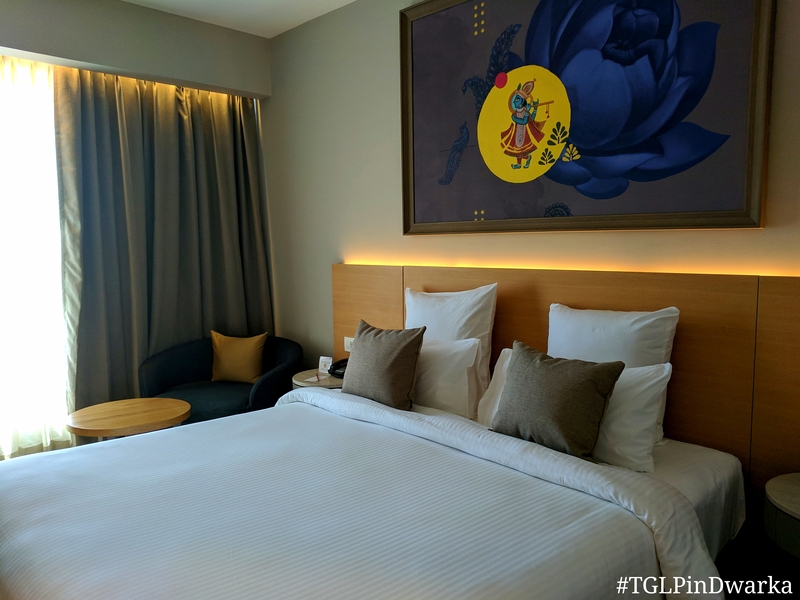 It was interesting to see the various lighting options in the room… from backlit headboards to ambient lights that make the room nothing less than cozy, it definitely gives you options based on your mood and of course, the time of the day. 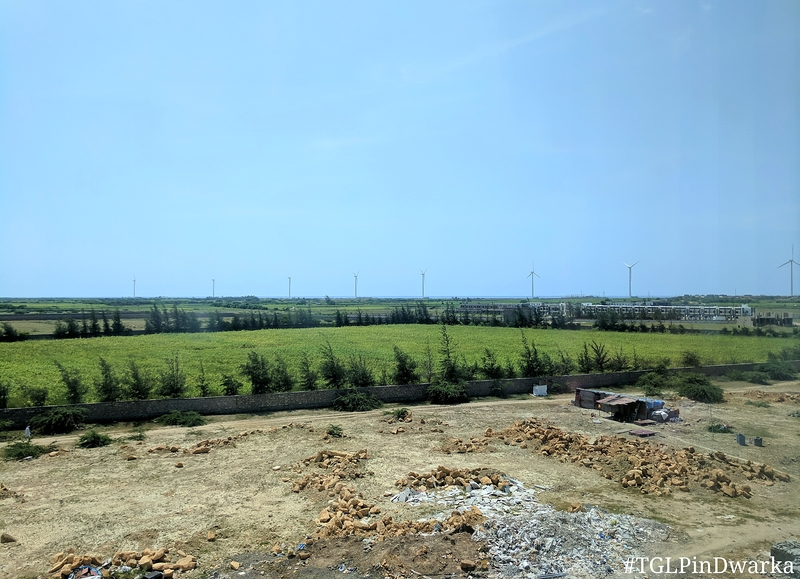 Open the curtains and you’re in for a view that may not be mesmerising kinda beautiful but definitely refreshing thanks to the open grazing land with cattle all around, a railway track at a distance and of course, the view of the sea horizon. It’s peaceful and exactly what one would hope for when you visit a pious land like Dwarka. 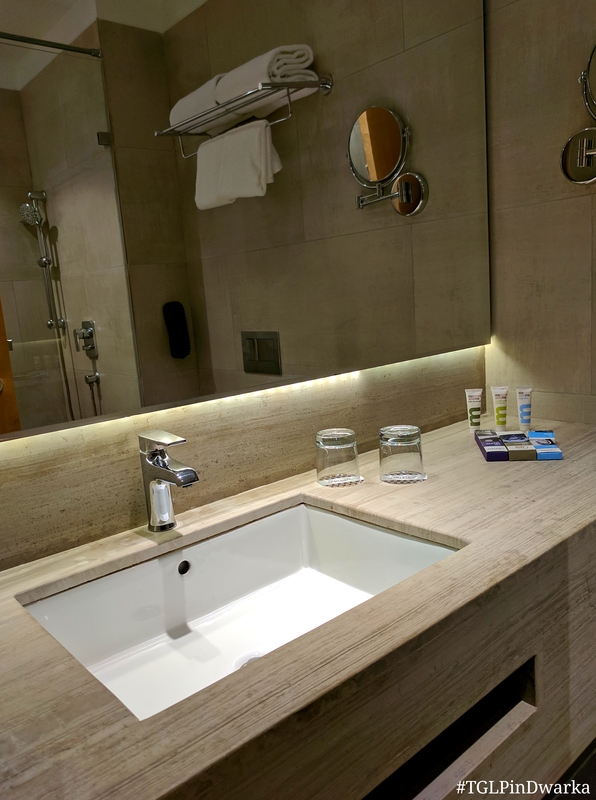 The washrooms are contemporary style, well lit, spacious, and do their job well although I realised they don’t have the most convenient stand/shelf to keep your personal toiletries in the shower area. All the meals we had were within the hotel. 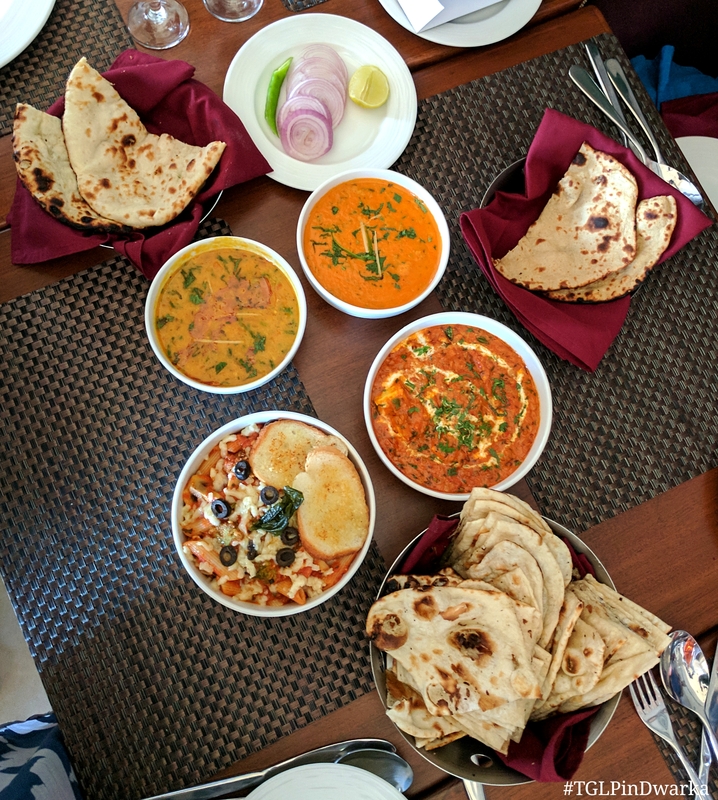 Considering Maakhan has pretty much everything to offer (from local items to good ol’ pasta – which by the way, was pretty damn good since I ate it with zero expectations). 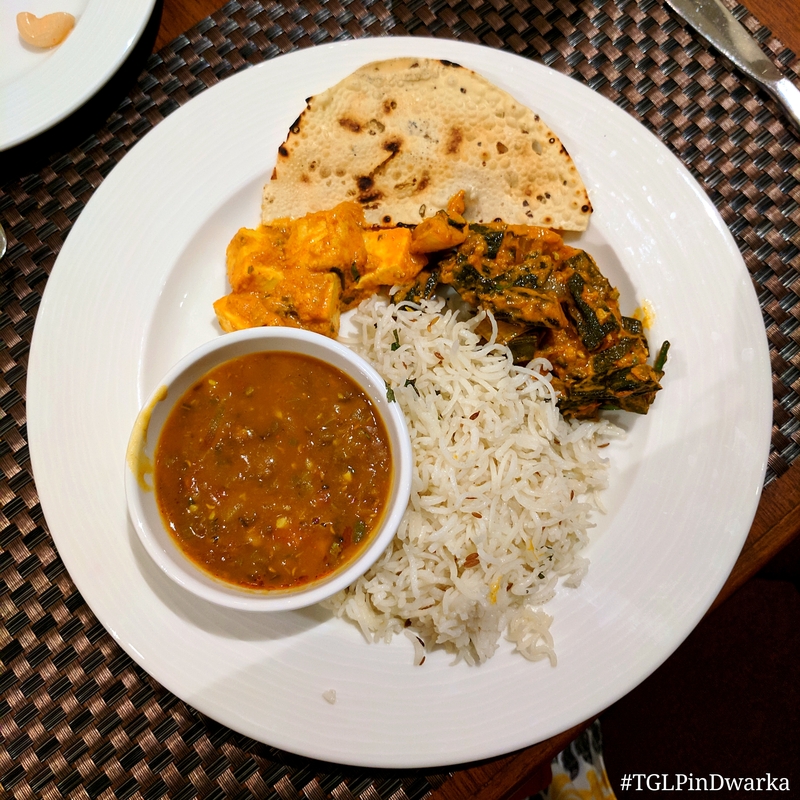 We got a taste of the North Indian food (butter naan, FTW!) 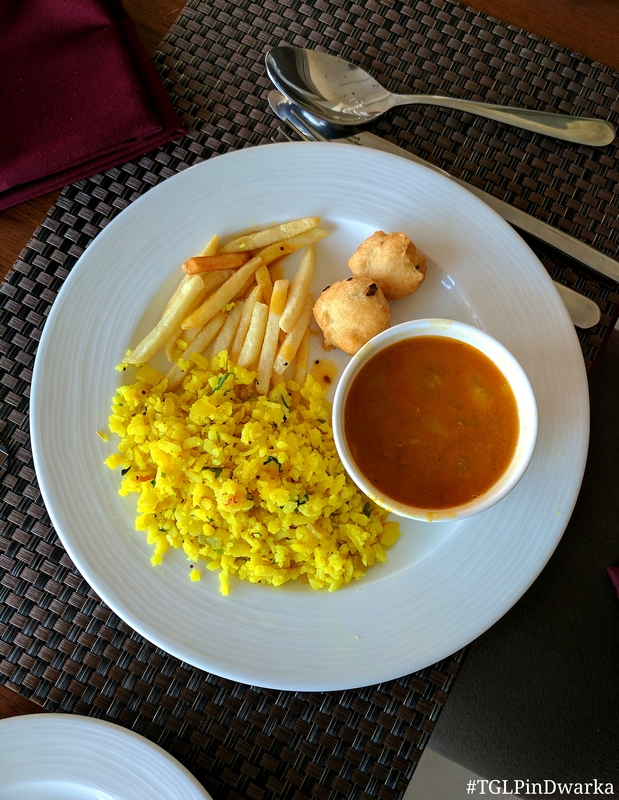 they have on offer, as well as a wholesome traditional Gujarati thali. I see no reason why one won’t enjoy any of the meals. 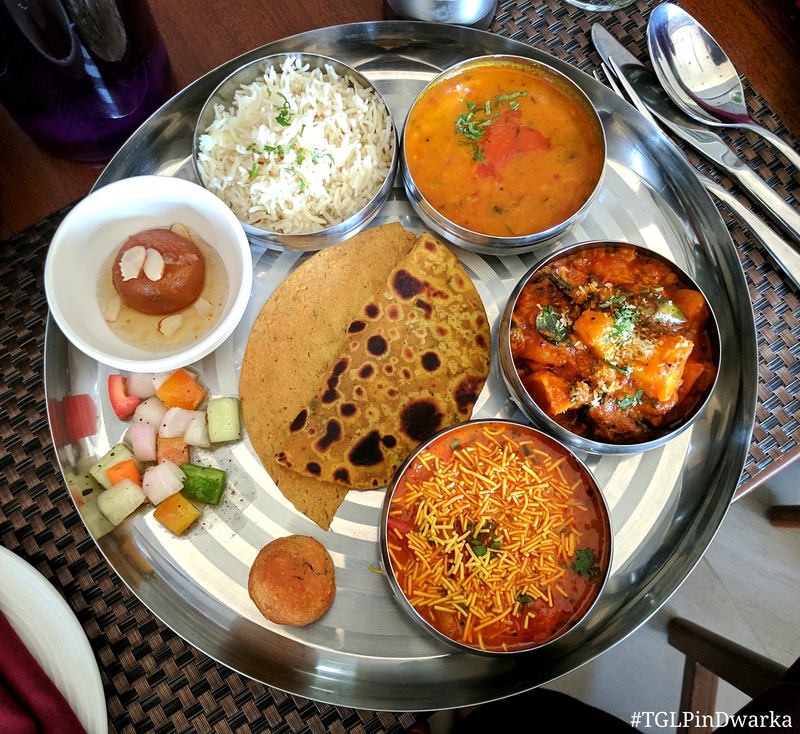 From sev tamatar nu shaak, traditional Gujarati meetha dal, to fresh theplas and more, the thaali isn’t as elaborate as a Rajasthani one but wholesome enough to end with a glass of chilled masala chaas. Even the breakfast spread is as homely as it can get. 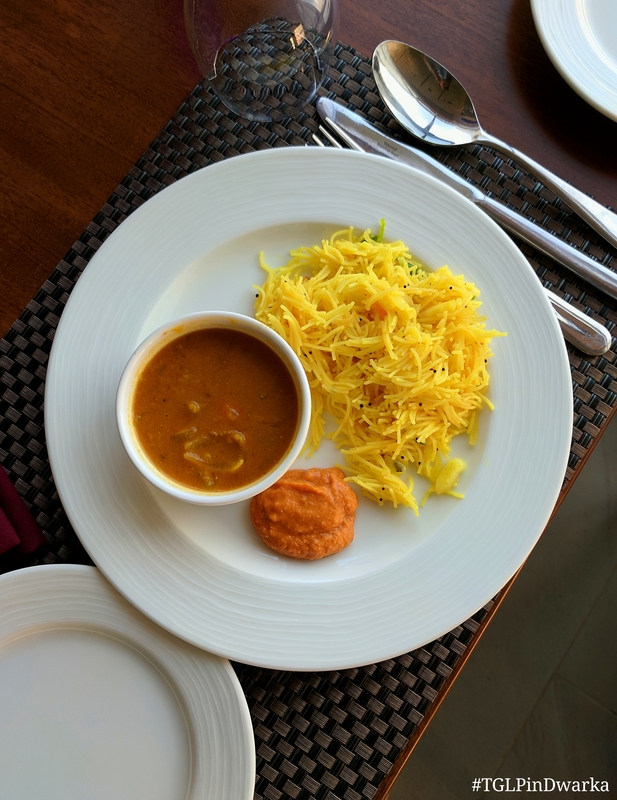 Vermicelli Upma, Sambhar (which was actually so good! 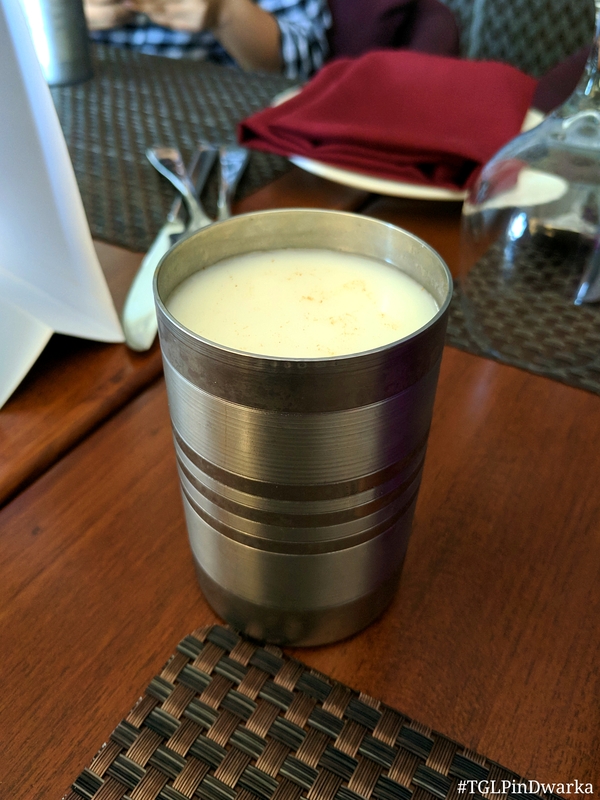 ), Poha, Medu Vada, Aloo Puri, Parathas, Baked Beans, Donuts and Croissants, etc… you name it and they probably have it. 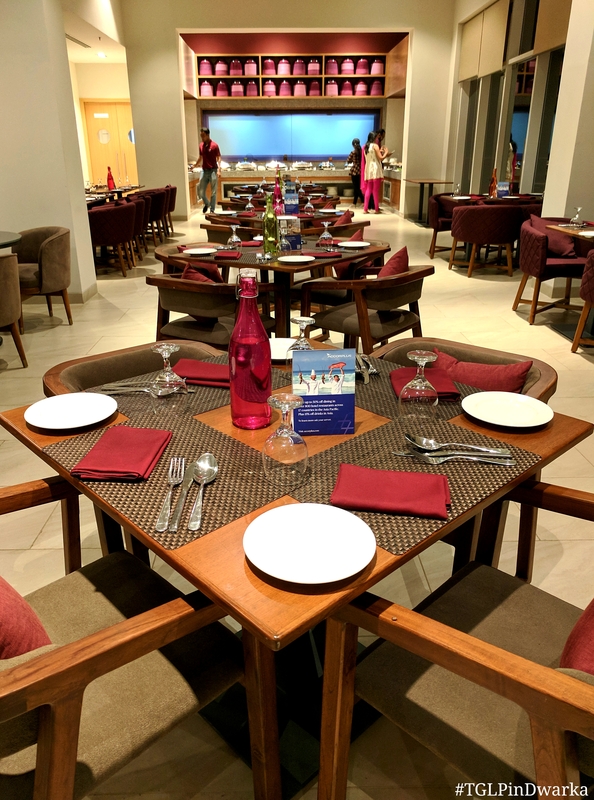 Basically I like the fact that their variety is catering to people from all around the country and while you’re here in Dwarka, the closest way to feel at home is when the food is comfortably familiar. This of course, is applicable for those who aren’t too keen on being experimental with local offerings. Being welcomed by a smiling staff is the least you expect in the hospitality industry. And here, they not only smiled but were genuinely warm and welcoming in their approach. 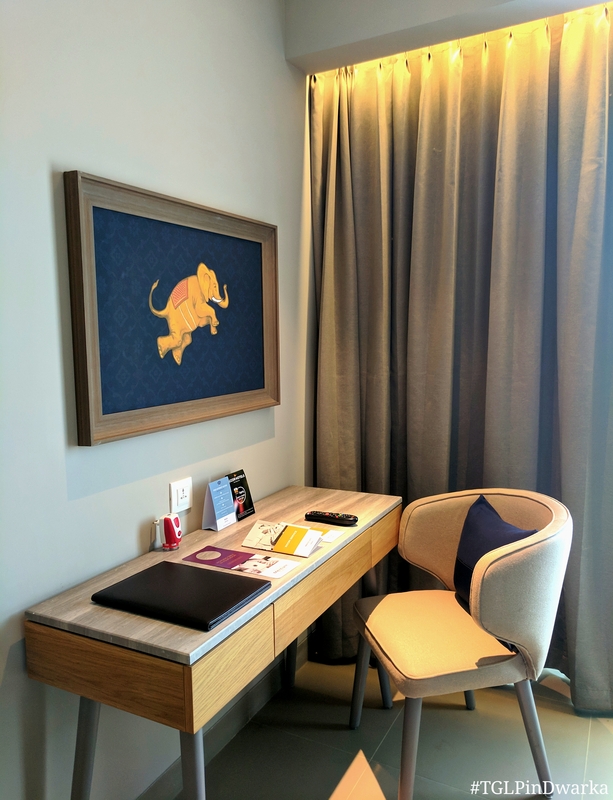 A big thank you to everyone who made sure our stay was not just comfortable, but memorable. 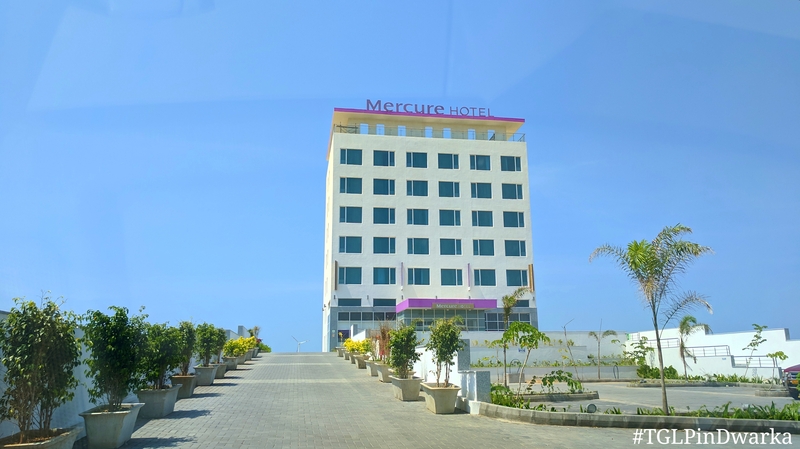 If you seek luxury and finesse even while you’re on a pilgrimage to Dwarka, Mercure Hotel is the place to check-in. 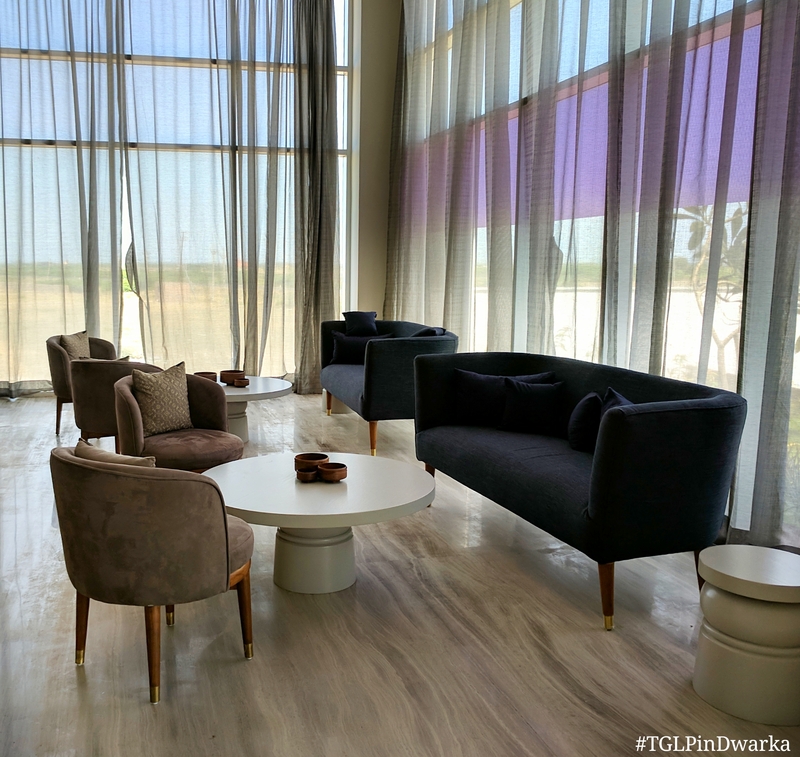 It’s modern enough to impress and well equipped with 5 star facilities, but at the same time, it exudes a welcoming and grounded vibe… Where the serenity in the air is evident and the hospitality is impeccable enough to make sure you go back home with some lovely memories. Lifestyle Blogger. Half Bawi. Feminist. Optimist. Storyteller. Good Food Lover. Travel Buff. Feline Fanatic. Makeup Junkie. Movie Enthusiast.